New Delhi 28/3/2008: South Africa has joined some 50 countries in the prohibition of asbestos. It was the fifth largest supplier of chrysotile asbestos. South African Environmental Affairs and Tourism Minister Marthinus van Schalkwyk has announced that the use, manufacture and processing of asbestos will be prohibited in South Africa with immediate effect. The Regulations for the Prohibition of the Use, Manufacturing, Import and Export of Asbestos and Asbestos Containing Materials will be promulgated on 28 March and will take effect immediately, said the minister during a media briefing on 27 March. The regulations form part of the South African Environment Conservation Act 1989. Ironically, India's Environment Protection Act, 1986 promotes continued use. India is one of the largest consumers of chrysotile asbestos. A February 2008 Confederation of Indian Industry (CII) survey that tracks and records the performance of the manufacturing sector, rated asbestos cement in the high growth category among others. What is not being recorded is the high growth rate of asbestos victims in India. This is being done in a studied manner as a classic case of Ostrich policy under the influence of Russian and Canadian governments amid reports of 10, 000 asbestos deaths per year in US and asbestos related disease epidemic in Europe. Ban Asbestos Network of India (BANI) appreciates the role of South African government in safeguarding the health of its citizens. But the contrast in India is quite noteworthy, following the revelations that showed how Chrysotile Asbestos Industry has dictated government's national and international asbestos policy both Union Ministry of Environment and Forests headed by the Prime Minister and Union Ministry of Labour & Employment informed Rajya Sabha and Lok Sabha that "Out of a total of Rs. 59.66 lacs allocated for the study by Ministry of Chemicals and Fertilizers, the Asbestos Cement Products Manufactures Association has contributed Rs. 16 lacs" on March 20, 2008 and March 17, 2008 respectively. It seems clear from the admission in the parliament that the Press Release of Union Commerce Ministry against the verdict of Appellate Body of World Trade Organisation that upheld chrysotile asbestos ban in France (European Community) soundly rejecting the "controlled use" and safe use argument of the Canadian asbestos industry was dictated by the Chrysotile Asbestos Industry. In its 95th Session of the International Labour Conference on 14th June 2006, International Labour Organtisation adopted a resolution for the elimination of all forms of asbestos from future use as the only way forward for protecting workers. It passed this resolution "Considering that all forms of asbestos, including chrysotile, are classified as known human carcinogens by the International Agency for Research on Cancer, a classification restated by the International Programme on Chemical Safety (a joint Programme of the International Labour Organization, the World Health Organization and the United Nations Environment Programme)". The fact remains, without amendment in the existing Import Policy of Ministry of Commerce for chrysotile asbestos, the asbestos consumption pattern is unlikely to change. The Ministry continues to promote exposure of Indian citizens while protecting the interest of the Russian and the Canadian chrysotile asbestos industry. Such callousness on the part of the Indian central and state governments and the political parties have sealed the fate of millions of workers and consumers that are exposed to this killer fiber with far reaching adverse implications on national public health. The only way forward is to ban the production and use of all forms of asbestos in the country and ensure that safe alternatives are put in place, which will address the issues of health, livelihood and economic implications of banning asbestos. Under the South African government's order, now the employers are required to draw up a register of all asbestos containing materials, conducts a risk assessment, educate and inform employees, protect employees from exposure to asbestos and conduct regular dust and health surveillance. No such provision exists in India. "A grace period of 120 days will be allowed for any person or merchant who is currently dealing in asbestos or asbestos containing materials to clear their stocks," said the South African Environment Minister. The main objectives of the new regulations is to prohibit the use, processing or manufacturing, of any asbestos or asbestos-containing product unless it can be proven that no suitable alternative exists. South Africa will now prohibit the import or export of any asbestos or asbestos containing product, and will also stop the import of any asbestos or asbestos containing waste material. In India, export and import of asbestos waste is banned but it has not been enforced as is evident from the manner which some 53 asbestos waste laden ships are languishing in Alang awaiting Indian Supreme Court's order. In India, it is estimated that 30 workers are dying every day due to asbestos exposure. BANI appeals to the Indian government to take lessons from the countries that treat the health of its citizens as national interest and above blind corporate interest. It is high time prohibition of asbestos consumption and a national register of asbestos products and its victims is announced. Out of several million workers exposed to asbestos in India, less than 30 have been compensated so far. The reasons for such a small number are: refusal by management sponsored studies to grant medical certifications to workers suffering from occupational diseases, lack of training for doctors in diagnosis of occupational lung diseases, deliberate misdiagnosis by doctors of asbestosis as either chronic bronchitis or tuberculosis. While ban on asbestos is a must, safe removal of asbestos from public, private buildings and other places would be long drawn and arduous process besides the compensation and rehabilitation of asbestos victims. *Note: Asbestos is a generic term, referring usually to six kinds of naturally occuring mineral fibres. Of these six, Chrysotile asbestos is used more commonly. It accounts for almost 90 per cent of the asbestos used in the industry. All types of asbestos including Chrysotile asbestos tend to break into very tiny fibre, almost microscopic. In fact, some of them may be up to 700 times smaller than human hair. Asbestos fibres are virtually indestructible. It has been widely used inconstruction and insulation materials - it has been used in over 3,000 different products. Apropos the article dated March 26th 2008(given below), while Canada is cleaning even its bathroom of its asbestos content, its consumption is rising dramatically in India. Out of several million workers exposed to asbestos in countries like India, less than 30 have been compensated so far. The reasons for such a small number are: refusal by management sponsored studies to grant medical certifications to workers suffering from occupational diseases, lack of training for doctors in diagnosis of occupational lung diseases, deliberate misdiagnosis by doctors of asbestosis as either chronic bronchitis or tuberculosis. Under Canadian and Russian influence, Indian Ministry of Chemicals and Fertilisers commissioned the National Institute of Occupational Health (NIOH), a premier research institute under the Indian Council of Medical Research (ICMR), to conduct a study titled Implementation of Rotterdam Convention on Prior Informed Consent Procedures- Study of Health Hazards / Environment Hazards resulting from use of Chrysotile Variety of Asbestos in the country. The study was commissioned in 2004 in the light of the proposed inclusion of chrysotile (popularly known as white asbestos) in the Prior Informed Consent (PIC) list of the Rotterdam Convention, which was recommended in 2005 and 2006 by the Chemical Review Committee of the Convention. On the face of it, the Government’s decision to base its position on science is laudable. Information gained using Canadian Right to Information corroborates the same. 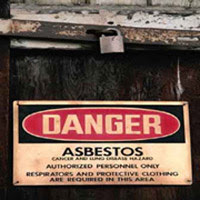 The Information Commissioner of Canada informed, “Canada is working with other countries to promote chrysotile asbestos. The Indian government has worked diligently in cooperation with the Indian Asbestos Information Centre (AIC) and the Canadian Asbestos Institute.” Canadian High Commission in India says, “A ruling which states that subjecting a worker to asbestos is a violation of human rights could have far reaching consequences whether or not it is binding". It also notes, “AIC is of the belief that problems with safe use of asbestos will arise in the unorganised sector. The information from Natural Resources Ministry of Canada was given under Access to Information Act. Information made available shows that Second Secretary (Commercial), Canadian High Commission in India has been in correspondence with Ministry of Environment, Labour, Commerce on asbestos issue. He has arranged bilateral meetings between the Ministers too in the past specifically "to discuss[tongue]romotion of the safe-use of chrysotile asbestos and confirm India's continued market access and policy approach (controlled-use) re chrysotle asbestos". He was informed the outcome of the April 11, 2002 meeting where Ban Asbestos Network of India (BANI) was formed. It reads, "Most of the articles have headlines similar to the Times of India story saying that Experts are calling for the banning of asbestos in manufacturing, mining, etc". "Be advised that the Courts in India are much more interventionist than in Canada. It is entirely possible that the High Court could issue the injunction and stop the use of asbestos. Eventually the matter would reach the Supreme Court but there is no predicting the outcome." The Brigadier also told me that a similar petition has been with the National Human Rights Commission. He does not seem concerned about this because the NHRC is a non-binding body.Second Secretary (Commercial) Canadian High Commission in India advised that "a finding stating that subjecting a worker to asbestos is a violation of human rights could have far reaching consequences whether or not the ruling is binding. I think that it may be necessary at some point to prepare an advocacy campaign to counter the arguments of the NGOs"
In such a context, what is alarming is that both consumers and workers do not enjoy any protection. There is a political consensus in India to expose workers and consumers to asbestos. 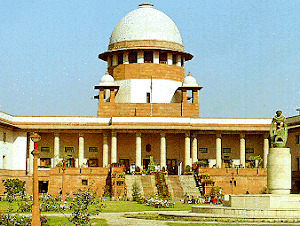 Till date there is no firm in India that has expertise in asbestos removal from existing public and private buildings like Indian Parliament, provincial legislatures, even the higher courts and the residences of these lawmakers and enforcers quite unlike the Canadian Parliament that has been decontaminated. Meanwhile, the asbestos roofs, its pieces and particles are seen strewn around in all the cities and villages in India where there is a upsurge in the construction industry. This underlines that while ban on asbestos is a must, safe removal of asbestos from buildings and other places would be long drawn and arduous process besides the compensation and rehabilitation of asbestos victims. There is no reason to continue the litany of unnecessary injury and death that comes from asbestos use. Alternatives to this killer fiber exist in the construction industry; the time to ban asbestos is now but Canadians and Russians are not letting it happen in India. What is noteworthy is that while the Canadian government system continues to expose Indian workers along with the Russians, despite such a barbaric act Canada has a persona of a civilized nation due to corporate media's sleight of hand. The City of Pointe Claire will be spending over $200,000 on two separate clean-up contracts in the next few months, and most of that is due to the presence of asbestos, according to Pointe Claire Mayor Bill McMurchie. "We're cleaning a bathroom at Stewart Hall and you would wonder where the asbestos was in the wall of a bathroom," McMurchie said. "It's asbestos fibre in the plaster," he said. Stewart Hall Building was constructed in 1916, when the health hazards posed by asbestos were not very well-known. 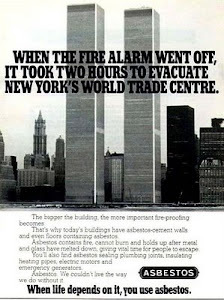 However, McMurchie explained that the asbestos in the building posed no immediate danger, since it is not exposed to the public. Only those parts of the plaster that have to be changed will be removed. "We have to be conscious of the fact that we're dealing with asbestos and that's a special contract," McMurchie said, explaining why the contract with N. Faucher construction company will come up to $106,280. Workers will be using specialized equipment to ensure they or the environment around them are not harmed by asbestos. Pointe Claire's City Hall, meanwhile, will have two of its furnaces replaced, once more requiring the work of a company that specializes in dealing with asbestos to remove it from the area safely. That contract is for $98 100. C.I.I. Technologies did not return phone calls as of press time due to the Easter break. Asbestos is a common name given to six different types of minerals including chrysotile, amosite and crocidolite. They were widely used in construction at the end of the 19th century and the dawn of the 20th due to their flame-retardant nature as well as tensile strength and resistance to electricity and chemical damage. However the use of asbestos has become heavily regulated and sometimes banned outright since it was discovered inhalation of these minerals' fibres can lead to serious illnesses. Note: No, this is not happening in India. It is unlikely to happen in India . Why should any Indian company plead guilty to acts of injury from Occupational Health and Safety hazards, when the law enforcement agencies are hand in glove with the perpetrators of such crimes? But while the Canadian government system continues to expose Indian workers along with the Russians, despite such a barbaric act Canada has a persona of a civilized nation due to corporate media's sleight of hand. $50,000 in the Ontario Court of Justice. The company failed to notify the ministry of the work involving asbestos. 66(1) of the Occupational Health and Safety Act. credited to a special provincial government fund to assist victims of crime. Defendant: Retirement Residences Genpar Inc.
Another Asbestos laden ship heading for India ? Another 'Blue Lady' heading for India? NEW YORK: Is another "toxic time bomb" headed for a ship-breaking yard in India? The US Environmental Protection Agency (EPA) has served notice on its owner for not obtaining the mandatory clearances. Rights groups say this is not enough. Pulled by a tug, the SS Oceanic (formerly SS Independence), an aged 682-foot ocean liner, sailed from San Francisco Feb 8, passed Hawaii and Guam and is now believed to be near Saipan, capital of the North Mariana Islands in the Western Pacific. According to the Basel Action Network (BAN) and Save the Classic Liners Campaign that tipped off the EPA, the ship's owner, Global Marketing Services (GMS), "routinely buys ships from all over the world and sends them to the notorious breaking beaches of Bangladesh, Pakistan and India". BAN estimates the ship is loaded with 210 tons of toxic polychlorinated biphenyl (PCB) contaminated material and 250 tons of asbestos. More than 1.5 billion pounds of PCBs were manufactured in the US before the EPA banned the production of this chemical class in 1978. PCBs were commonly used in paints, industrial equipment, plastics and rubber products. EPA banned this class of chemicals after tests showed that PCBs cause cancer in animals and affect nervous, immune, and endocrine systems in humans. The last owner of the classic 1950 liner Oceanic was Norwegian Cruise Lines (NCL) that "already has a reputation for negligence and evasion of international and national environmental and safety laws", a BAN statement said. Another NCL liner, the former SS Norway - also known as the "Blue Lady" - is anchored off the Alang ship-breaking yard in Gujarat. It was the focus of a bitter legal battle last year with the Indian Supreme Court finally permitting its dismantling but laying down stringent guidelines on environmental safety. The Blue Lady carries 10 tons of asbestos. It was not immediately clear whether GMS has agreed to comply with the new guidelines. On their part, the two activist groups have expressed shock that the EPA is only seeking to levy a fine and is not taking urgent action to stop the violation and bring the toxic ship back to the US. "The government is letting the ship owners get away with what could be tantamount to murder," said Jim Puckett of the Seattle-based BAN. "It is merely slapping these perpetrators on the wrist and allowing the offence to continue. Lives are at stake here so why on earth is the government not demanding that the ship be turned back to US territory at once?" he wondered. "EPA filed suit because the export of PCBs is illegal under the Toxics Substances Control Act (TSCA). But the government has not filed an injunction against the ongoing export but is merely seeking fines. Furthermore, by the time the lawsuit is decided, the damage will have been done," BAN maintained. The EPA issued a federal complaint against GMS on March 18 for "distribution in commerce and export of PCB-containing materials on the MV Oceanic, formerly the SS Independence, a ship being sent to be scrapped overseas". Fines against the company may be assessed up to $32,500 per violation per day, the EPA said. GMS has 30 days to file an answer to the complaint to avoid a penalty assessment without a hearing. According to BAN and the Save the Classic Liners Campaign, the US Maritime Administration (MARAD) was warned of the latest export well before the vessel left San Francisco "and that it was likely illegal and yet they did nothing to stop it". End of the asbestos industry in Canada? This may be the end of the asbestos industry in Canada. The LAB Chrysotile owned asbestos mine in Thetford Mines, Quebec is the last mine in operation in Canada and has now gone bankrupt. It was losing money. Mazarin Inc. (TSX VENTURE: MAZ.H) announces that its wholly-owned subsidiary, 9075-6453 Quebec Inc. was forced to assign all of its assets in the hands of Raymond Chabot Inc., trustee. The subsidiary is the owner of the Bell mine in Thetford Mines. Last August, it had authorized, under certain conditions, 9184-6808 Quebec Inc. (LAB Chrysotile) to operate the mine. At the end of this month, LAB Chrysotile will cease operations at the Bell mine. After considering several avenues, the subsidiary has concluded that its limited financial resources did not allow it to operate the mine or to meet its financial obligations on an ongoing basis. This press release contains forward-looking statements which reflect the Company's current expectations regarding future events. The forward-looking statements involve risks and uncertainties. Actual results could differ materially from those projected herein. NEW DELHI, MARCH 20 : In a clear conflict of interest, the government today admitted in Parliament that the first comprehensive study to find out the environmental and health impacts of asbestos on workers is partly funded by the asbestos industry itself. The findings of the study will be submitted by the year-end. Union Ministry of State for Environment and Forests Namo Narain Meena admitted during question hour today that “out of a total of Rs 59.66 lakh allocated for the study by Ministry of Chemicals and Fertilisers, the Asbestos Cement Products Manufactures Association has contributed Rs 16 lakh”. Minister of State for Labour and Employment Oscar Fernandes (with his officials at the ILO conference) had made a similar statement on March 17. The Labour Ministry justified this by saying it was to “ensure cooperation of the industry”. The National Institute of Occupational Health (NIOH), Ahmedabad has been entrusted with the study on the impact of chrysotile (white) asbestos, with the objective “to find out the concentration of asbestos fibres in the work zone and to assess the health status of the workers and the residents in the vicinity of the industry”. The study is being carried out in major asbestos-based products manufacturing units located in Kolkata, Silvasa, Vapi and Hyderabad. Apart from determining the domestic policy, the study is crucial to firming India’s position on chrysotile asbestos in the Rotterdam Convention. Under the convention, an expert body recommends whether a hazardous product should be placed on a special list which requires countries to obtain prior consent before they can export the product. Under massive criticism from all quarters both Union Ministry of Environment and Forests and Union Ministry of Labour & Employment informed Rajya Sabha and Lok Sabha on that the government has undertaken a conflict of interest ridden study to give clean chit to chrysotile asbestos, a cancer causing mineral. Asbestos exposure causes incurable but preventable cancer to both workers and consumers. Both Namo Narain Meena, Union Ministry of State for Environment and Forests and Oscar Fernandes, Minister of State for Labour and Employment (Independent Charge) acknowledged that “Out of a total of Rs. 59.66 lacs allocated for the study by Ministry of Chemicals and Fertilizers, the Asbestos Cement Products Manufactures Association has contributed Rs. 16 lacs” on March 20, 2008 and March 17, 2008 respectively. Fernandes said in a written reply, “A project titled: "A study of health hazards/environmental hazards resulting from the use of chrysotile asbestos in the country" is under way with National Institute of Occupational Health, Ahmedabad.” Earlier, an Objection Letter by Ban Asbestos Network of India (BANI) and Corporate Accountability Desk- The Other Media was sent to the Ministry of Chemicals & Fertilisers against because this study is crucial to India’s position on chrysotile asbestos in the Rotterdam Convention and its domestic policy on the killer fiber. The letter dated March 9, 2008 had pointed out that throughout the world, there is a growing consensus that exposure to all types of asbestos—including chrysotile—is fatal. This understanding is shared by the International Labour Organisation, the World Health Organisation’s International Agency for Research on Cancer, the International Programme on Chemical Safety, the European Union, the Collegium Ramazzini, the International Social Security Association, the World Trade Organisation, the International Commission on Occupational Health, the International Federation of Building and Woodworkers, the International Metalworker’s Federation and governments of over 40 countries and scores of independent scientists. In such a backdrop, it was rather perplexing that the Ministry had decided to reinvent the wheel by conducting a new study rather than reviewing and taking into consideration the existing scientific evidences and credible opinions. As for the industry argument of “controlled use” and “how technology has made working conditions better”, these are myths long discredited by the scientific community across the globe and national governments. In its 2001 verdict, Appellate Body of World Trade Organisation while upholding chrysotile asbestos ban in France (European Community) had soundly rejected the “controlled use” and safe use argument of the Canadian asbestos industry. In its 95th Session of the International Labour Conference on 14th June 2006, International Labour Organtisation adopted a resolution for the elimination of all forms of asbestos from future use as the only way forward for protecting workers. It passed this resolution “Considering that all forms of asbestos, including chrysotile, are classified as known human carcinogens by the International Agency for Research on Cancer, a classification restated by the International Programme on Chemical Safety (a joint Programme of the International Labour Organization, the World Health Organization and the United Nations Environment Programme)”. The fact remains, without amendment in the existing Import Policy of Ministry of Commerce for chrysotile asbestos, the asbestos consumption pattern is unlikely to change. The Ministry had issued a Press Release in the matter WTO order against chrysotile asbestos and continues to promote exposure of Indian citizens while protecting the interest of the Russian and the Canadian asbestos industry. 1. Conflict of Interest: The study is being part sponsored by the asbestos industry, its representatives are also part of the review committee meetings. 2. Industry Consultation: In almost every meeting of the review committee, the conditionality for industry consultation prior to finalization of the study report is emphasized. 5. Industry Science: Not only is the industry being consulted on the study, it is also providing the science for it. There is no way of knowing the extent to which the industry data will be selective, and without knowing that it is impossible to confirm whether industry's input to the study will be truly representative of industry's actual experience and knowledge. 6. Moreover the scientific data being provided by the industry to the government is highly questionable. A case in point is the study - Understanding Chrysotile Asbestos: A New Perspective Based Upon Current Data by a freelance toxicologist Dr D.M. Bernstein. 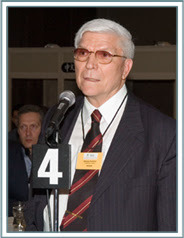 Dr Bernstein is known for doing “industry-sponsored science” and has often attended international scientific meetings to advocate the “innocence” of chrysotile. This study will seal the fate of millions of workers handling this substance and will have far reaching implications on national public health. The only way forward is to ban the production and use of all forms of asbestos in the country and ensure that safe alternatives are put in place, which will address the issues of health, livelihood and economic implications of banning asbestos. The purpose of the U.N. Rotterdam Convention is to protect life and the environment by controlling trade in hazardous chemicals and pesticides.Now that these dangerous products, such as abestos, are being controlled or banned in the industrialized world, companies are aggressively targeting developing countries and the countries of Eastern Europe for expanded sales and increased profits.Although most Canadians do not know this, our government has been a world leader in sabotaging the Rotterdam Convention.In a 24 hour period, grass-roots groups from around the world signed the challenge below, calling on Canada and its handful of allies to stop sabotaging the Convention and put human life and the environment first.Please support them. If you haven’t already done so, send the letter to Prime Minister Harper calling for Canada to support the Rotterdam Convention and the World Health Organization call for a ban on asbestos. 2008 is the 10th anniversary of the adoption of the Rotterdam Convention, whose purpose is to protect human health and the environment by controlling international trade in hazardous chemicals and pesticides. But instead of celebrating, a number of environmental, labour and health groups are sounding the alarm. Industry interference and political sabotage by a handful of countries, led by Canada, are strangling the Rotterdam Convention, say the groups from Asia, Africa, South and North America, and Europe. Because of this interference, action to implement the Convention has been obstructed and the groups are concerned that progress at meetings planned for this year will likewise be blocked. Under the Convention, an expert body, called the Chemical Review Committee, recommends whether a hazardous product has met the criteria of the Convention and should be placed on a special list which requires countries to obtain Prior Informed Consent before they can export the product to another country. The Convention, which has been ratified by 120 countries, came into effect in February 2004. At its last meeting in 2006, over one hundred countries approved the recommendation made by the Chemical Review Committee that chrysotile asbestos be listed for Prior Informed Consent. But Canada, together with Kyrgyzstan, India, Iran, Peru and Ukraine, simply refused to let the Convention’s process work and blocked action on the recommendation. They were supported by Zimbabwe, Russia and Indonesia, who have not ratified the Convention. Canada argued that unless every single country agrees, no action should be taken to implement the Convention. “This is a death sentence for the Convention,” said Joan Kuyek of Mining Watch Canada. The World Health Organization and the International Labour Organizations, among others, have called for chrysotile asbestos to be banned. Most industrialized countries have banned it. Asbestos companies are therefore aggressively targeting developing countries and the countries of Eastern Europe for expanded sales. “If chrysotile asbestos, a known deadly carcinogen, which fully met all the requirements of the Convention can be prevented from being listed, then the Convention is in grave peril,” said Laurie Kazan-Allen of the Ban Asbestos International Secretariat. “Industry is giving false information on chrysotile asbestos in the Eastern European and Central Asian countries, pretending that their local asbestos does not have the proven negative health effects. We have bought a few samples of asbestos on local markets, and the product is exactly the same as the asbestos which has been banned in most of the industrialized nations. We are very worried about the health of labourers in the building sector, and especially for children, as the asbestos is being used in public buildings like daycare centers and schools”, says Sascha Gabizon, executive director of Women in Europe for a Common Future. We are calling for a stop to industry interference in a Convention meant to protect health and the environment, say the groups. We are, in particular, challenging Canada, Kyrgyzstan, India, Kazakhstan, Iran, Peru and Ukraine, as well as Russia, Zimbabwe and Indonesia (who have not signed the Convention) to stop their irresponsible conduct. Our message to them is – Stop the sabotage. Let the Convention do its job of protecting lives. *Kathleen Burns, Ph.D., Director, Sciencecorps, U.S.A.
*Linda Reinstein, Executive Director, Asbestos Disease Awareness Organization, U.S.A.
*Jamie Harvie, Executive Director, Institute for a Sustainable Future, U.S.A.
*Dr. C.K. Durbak, Chair and CEO, World Information Transfer, Inc., U.S.A.
*Erik Jansson, President, Department of the Planet Earth, Inc., U.S.A.
Ban Asbestos Canada (BAC) applauds the NDP's support for the World Health organization's call for action to eliminate asbestos disease and asbestos use around the world. 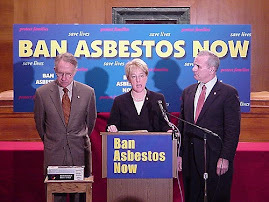 BAC is a national coalition of labour, health, and environmental groups that are dedicated to banning asbestos in Canada, ensuring compensation for all affected Canadian workers, and to promoting international conventions aimed at controlling the international trade in hazardous substances, such as asbestos. “We look forward to working with the NDP to ensure both real economic support for laid off asbestos workers and a comprehensive campaign for just compensation for thousands of Canadian workers afflicted with asbestos caused disease,” said Wayne Peppard, Executive Director of the BC & Yukon Construction Building Trades Council. “Government support for this dying industry that has exploited Quebec workers must stop now." "From a public health point of view, the NDP's support for the WHO's position is, in our view, the only possible responsible position," stated Micheline Marier of the Association of Asbestos Victims of Quebec. "The population in the Asbestos region has paid a heavy price since the beginning of mining this mineral and we call on governments to assist in the revitalization of the region, as well as the environmental clean-up of the former asbestos mines," said Marier. Increasing numbers of Canadians are dying from asbestos, the world’s biggest occupational health killer. In 2007 in B.C., for example, over half of occupational deaths were from asbestos-related disease. “This carnage from asbestos related fatalities is disastrous for those workers and their families,” Peppard said. “It’s long past time that the Canadian government stop the production and use of asbestos”. 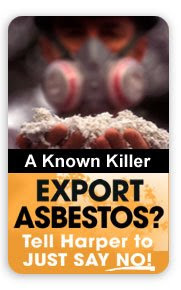 Canada exports over 95% of its asbestos to developing countries and has continually undermined any attempt to have asbestos banned or labeled as a dangerous product. Kathleen Ruff - 250-847-1848; Micheline Marier - 514-847-8381. The National Institute of Occupational Health (NIOH),Ahmedabad has been entrusted with a study on environmental and health impacts of the usages of Chrysotile Asbestos with an objective to find out the concentration of asbestos fibres in the work zone and to assess the health status of the workers and the residents in the vicinity of the industry. The study is in progress in major Asbestos based products manufacturing units located in Kolkata, Silvasa, Vapi and Hyderabad. Out of a total of Rs. 59.66 lacs allocated for the study by Ministry of Chemicals and Fertilizers, the Asbestos Cement Products Manufactures Association has contributed Rs. 16 lacs. Since the NIOH study is still under progress, no report was presented before the Chemical Review Committee of Rotterdam Convention held at Geneva during March, 10-13,2008. This information was given by the Minister of State for Environment and Forests Shri Namo Narain Meena, in a written reply to a question by Shri B.K. Hariprasad in the Rajya Sabha today. The government and the Indian asbestos industry are colluding to "generate" a science that will help the industry survive a global move to cut down use of the cancer-causing material. Several prominent trade unions and civil society groups have complained to the ministry of chemicals and fertilisers against such a move, presenting evidence secured through the Right to Information Act proving that industry and the ministry was "manufacturing" convenient science. India imports more than 3 lakh tonnes of asbestos from two major producers — Canada and Russia — and the domestic industry processes it primarily for the construction sector. Roughly one lakh labourers working in domestic asbestos factories are exposed to asbestos fibre that WHO and several other international organisations as well as more than 40-odd countries claim causes cancer when inhaled. The groups, in their letter, referred to documents that proved the study being conducted by the National Institute of Occupational Health (NIOH) — assessing the impact of asbestos on workers — was being manipulated by the ministry and industry. The government plans to take this study to a critical global meeting — Rotterdam Convention — this year. Under the convention, an expert body called the Chemical Review Committee recommends whether a hazardous product has met the criteria of the convention and should be placed on a special list, which requires countries to obtain prior consent before they can export the product. India has continuously opposed the move to put white asbestos on the list. The NIOH study could help India block the move yet again. The study is partly funded by the industry. The terms of reference given to NIOH by the ministry are explicit: "The deliverables will include generation of data which would justify the safe standards of its usage as also the reasons/rationale justifying its non-inclusion/or otherwise in the Prior Informed Consent (list)..."
A project titled: “A study of health hazards/environmental hazards resulting from the use of chrysotile asbestos in the country” is under way with National Institute of Occupational Health, Ahmedabad. The total cost of the project is Rs. 59.66 lakhs. Out of this, Government of India (Ministry of Chemicals and Fertilizers) is contributing Rs. 43.66 lakhs and the balance of Rs. 16 lakhs is contributed by the Asbestos Cement Product Manufacturer Association to ensure cooperation and involvement of the industry. This information was given by the Minister of State for Labour and Employment Shri Oscar Fernandes (Independent Charge) in a written reply in the Lok Sabha. New Delhi/Geneva: The Fourth meeting of the Chemical Review Committee of UN treaty called Rotterdam Convention on the Prior Informed Consent Procedure (PIC) for Certain Hazardous Chemicals and Pesticides in International Trade is underway. It is scheduled from 10 to 13 March 2008, in Geneva. Year 2008 is the 10th anniversary of the adoption of the Rotterdam Convention, whose purpose is to protect human health and the environment by controlling international trade in hazardous chemicals and pesticides. But instead of celebrating, a number of environmental, labour and health groups are sounding the alarm. The proposed inclusion of chrysotile asbestos in the PIC procedure in the upcoming 4th Conference of Parties (October 2008) of the Rotterdam Convention and would also be presented at the Chemical Review Committee (CRC) of the Convention. There are 39 chemicals listed in Annex III of the Convention and subject to the PIC procedure, including 24 pesticides, 4 severely hazardous pesticide formulations and 11 industrial chemicals. At its last meeting in 2006, over one hundred countries approved the recommendation made by the Committee of experts that chrysotile asbestos be listed for Prior Informed Consent. But Canada, together with Kyrgyzstan, India, Iran, Peru and Ukraine, simply refused to let the Convention's process work. They were supported by Zimbabwe, Russia and Indonesia, who have not ratified the Convention. "At the March 10-13 meeting of the Convention's Chemical Review Committee, taking place in Geneva right now, sixteen representatives from the chemical industry and, in particular, lobbyists for the asbestos industry will be attending as official observers," noted Laurie Allen Kazan of International Ban Asbestos Secretariat. "This is extremely disturbing." Ban Asbestos Network of India (BANI) finds it alarming to note that no representative from environmental, health or labour groups are present at the meting. We are calling for a stop to industry interference in a Convention meant to protect health and the environment, say the groups. We are, in particular, challenging Canada, Kyrgyzstan, India, Kazakhstan, Iran, Peru and Ukraine, as well as Russia, Zimbabwe and Indonesia (who have not signed the Convention) to stop their irresponsible, destructive conduct. "The Indian government has included a representative of the asbestos industry in its delegation," said Madhumitta Dutta of Corporate Accountability Desk-The Other Media. "And a study on asbestos presently being carried out by the Indian government was, in fact, funded by the asbestos industry." This study- an exercise in sophistry-has been done to satisfy the Chemical Review Committee and to take a pro-asbestos Indian position at the 4th Conference of Parties (October 2008) of the Convention. Mandate of Chemical Review Committee is to "make every effort to make its recommendations by consensus. If all efforts at consensus have been exhausted, and no consensus reached, such recommendation shall as a last resort be adopted by a two-thirds majority vote of the members present and voting." Jasbir Singh, Industrial Adviser, Union Ministry of Chemicals & Fertilizers is the expert, named by Union Ministry of Chemicals, Government of India, to be a member of the Chemical Review. "Chemical Review Committee" is the subsidiary body of the Rotterdam Convention. There is documentary proof to suggest that Ministry of Chemicals has an incestuous relationship with the asbestos industry. An objection letter highlighting the same has been sent to the Ministry in question. The World Health Organization and the International Labour Organizations, among others, have called for chrysotile asbestos to be banned and most industrialized countries have banned it. Asbestos companies are therefore aggressively targeting developing countries and the countries of Eastern Europe for expanded sales. "If chrysotile asbestos, a known deadly carcinogen, which fully met all the requirements of the Convention can be prevented from being listed, then the Convention is in grave peril," said Gopal Krishna of Ban Asbestos Network of India (BANI). "Industry interference is killing the Convention," said Dutta. "Countries allied to the asbestos industry are putting the profits of the industry ahead of the lives of people." Industry interference and political sabotage by a handful of countries, led by Canada, are strangling the Rotterdam Convention; say the groups from Asia, Africa, South and North America, and Europe. Because of this interference, no action has been possible under the Convention for the past four years and the groups are concerned that progress at meetings planned for this year will likewise be blocked. The Convention creates legally binding obligations for the implementation of the Prior Informed Consent (PIC) procedure. A Conference of Plenipotentiaries in Rotterdam, the Netherlands, adopted the text of the Convention in 1998. The Convention, which has been ratified by 110 countries, came into effect in February 2004. One of the fundamental principles in the operation of the Rotterdam Convention is that a country when it has adopted a final regulatory action to ban or severely restrict a chemical notifies the secretariat of that action. Under the Convention, a Committee of experts recommends whether a hazardous product has met the criteria of the Convention and should be placed on a special list, which requires exporting countries to obtain Prior Informed Consent. This makes the UN treaty very significant to protect human health and environment from lethal chemical hazards. Our message is – Let the Convention live. asbestos insulating board and loose asbestos in ceiling or floor cavity. Following a ruling by a Washington State Court of Appeals, victims of secondary asbestos exposure have enjoyed a hard earned victory - The ruling will make it easier for those exposed to asbestos as the result of the work of family members living in the same home to make a claim for their asbestos related diseases such as asbestos cancer, lung cancer, and mesothelioma. The new ruling overturns a previous ruling made by a lower court, and sets a set a precedent that could allow hundreds of family members and others living in the same home to file their own claims. This means that those suffering from asbestos related illnesses due to exposure from the clothes or body of a loved one that worked with asbestos, commonly known as ’secondary exposure’, can now successfully sue the employer for compensation. Until this ruling, is has proven very difficult such cases to proceed. Asbestos exposure has been linked to several deadly diseases, including lung cancer and mesothelioma, a cancer of chest lining that may take as long as 15-40 years to manifest. Once diagnosed, mesothelioma patients often have only months to live. Leigh Day & Co has successfully recovered over £170,000 in damages for a former hospital manager who developed mesothelioma, an asbestos-related lung cancer, following his exposure at a hospital during the 1970’s and 1980’s. Luc Nadal worked as a charge nurse at Woodhurst Hospital near Crawley in Sussex. This meant he had to go into the basement area which contained a boiler and extensive pipework which was lagged with suspected asbestos insulation. He and his workmates described how the insulation broke down over time and may have been damaged by work processes there. Through documents obtained during the course of Mr Nadal’s claim, it became apparent that extensive asbestos removal works took place at the hospital, but not until the mid-1990’s. Mr Nadal’s former employers refused to accept that he had been exposed to dangerous quantities of asbestos, or even that asbestos was present at the hospital. Despite this Mr Nadal successfully achieved a significant global settlement to his claim, which he intends to use to pay for his medical treatment and care at home. Mr Nadal was represented by Leigh Day & Co's Daniel Easton, who specialises in asbestos disease cases. The case was pursued through the High Court's fast track mesothelioma system to enable a resolution of the claim within just a few months of Mr Nadal instructing Leigh Day & Co.
"This was a very hard fought case despite the fact that asbestos was extensively used in public buildings such as hospitals during the 1960's and 1970's. Mr Nadal was fully cross-examined by the Defendant under oath and remained clear on the evidence he gave about his former working life. It is a credit to Mr Nadal that we were able to achieve a good settlement for him. I am very pleased to have been able to act for him in this matter and to see a successful conclusion that will benefit both he and his family". Subject: Objection to the Ministry of Chemicals & Fertilisers-Asbestos Industry sponsored study- Implementation of the Rotterdam Convention on the Prior Informed Consent Procedures-Study of Health Hazards/Environment Hazards resulting from use of Chrysotile variety of asbestos in the Country. We are writing to voice our strong objections to the above mentioned study commissioned by the Ministry of Chemicals & Fertilisers to National Institute of Occupational Health and part sponsored by the Asbestos Industry. We understand that the study has been commissioned keeping in mind the proposed inclusion of chrysotile asbestos in the PIC procedure in the upcoming 4th Conference of Parties (October 2008) of the Rotterdam Convention and would also be presented at the Chemical Review Committee (CRC) of the Convention in March 2008. As we understand, this study will form India’s position on chrysotile asbestos in the Convention as well as its domestic policy on the substance. While it’s a rational step to conduct a scientific assessment prior to taking an informed decision at an international forum, we would like to point out that throughout the World, there is a growing consensus that exposure to all types of asbestos—including chrysotile—is fatal. This understanding is shared by the International Labour Organisation, the World Health Organisation’s International Agency for Research on Cancer, the International Programme on Chemical Safety, the European Union, the Collegium Ramazzini, the International Social Security Association, the World Trade Organisation, the International Commission on Occupational Health, the International Federation of Building and Woodworkers, the International Metalworker’s Federation and governments of over 40 countries and scores of independent scientists. Therefore, we find it rather perplexing that the Ministry had decided to reinvent the wheel by conducting a new study rather than reviewing and taking into consideration the existing scientific evidences and credible opinions. In India, it is believed that over 100,000 workers are getting exposed to asbestos fibres every year. There have been independent studies done, especially of workers exposed to chrysotile asbestos, which have conclusively shown that workers exposed to this substance have been diagnosed with asbestosis. For instance, number of cases of asbestosis and lung cancer has been detected amongst workers in Hindustan Composites Limited (Ghatkopar factory, Mumbai), Digvijay Cements (Ahmedabad factory), Ahmedabad Electricity Corporation (Ahmedabad) and so on. As for the industry argument of “controlled use” and “how technology has made working conditions better”, these are myths long discredited by the scientific community across the globe and national governments. In its 2001 decision, World Trade Organisation while upholding asbestos ban in France had soundly rejected the “controlled use” argument. In its 95th Session of the International Labour Conference in June 2006, International Labour Organtisation adopted a resolution for the elimination of all forms of asbestos from future use as the only way forward for protecting workers. It passed this resolution “Considering that all forms of asbestos, including chrysotile, are classified as known human carcinogens by the International Agency for Research on Cancer, a classification restated by the International Programme on Chemical Safety (a joint Programme of the International Labour Organization, the World Health Organization and the United Nations Environment Programme)”. 1. Conflict of Interest: From information obtained by us under the Right To Information Act 2005, we find that not only is the study is being part sponsored by the asbestos industry, its representatives are also part of the review committee meetings. 7. Denial and Secrecy: For a study which would form the basis for the Indian government’s position on asbestos at home and internationally, and have a large implication on public health, especially for workers handling asbestos, it has been closely guarded from trade unions, public interest groups and even the Indian Parliament. Meanwhile, the industry is being consulted at every step of the way. Even the information unearthed under RTI Act was selective. It appears that there is a systematic effort to stonewall all requests for information about the study. From the partial information that we have received from the Ministry under the RTI Act, we have strong reasons to believe that this study is a travesty of what is considered credible science. The fact that it is sponsored, reviewed, and vetted by those who stand to gain or lose from its findings makes it absolutely unethical. Besides, the secrecy surrounding its outcomes makes it suspect in the public eye. We strongly believe that if this study is presented at the CRC and COP 4 of Rotterdam Convention, it will hold no water in the scientific and international community and will be a matter of great embarrassment and shame for India. This study needs to be immediately scrapped. India should form its position based on existing credible scientific data and opinions and experiences of trade unions/labour-health groups in a transparent manner and not be influenced by corporate interest. Please remember that this study will seal the fate of millions of workers handling this substance and will have far reaching implications on national public health. The only way forward is to ban the production and use of all forms of asbestos in the country. And ensure that safe alternatives are put in place, which will address the issues of health, livelihood and economic implications of banning asbestos. Despite the asbestos disease epidemic in US, Europe, Australia, Japan, South Africa and elsewhere, a recent document titled "HUMAN HEALTH RISK ASSESSMENT STUDIES IN ASBESTOS BASED INDUSTRIES IN INDIA" by Central Pollution Control Board (CPCB), Union Ministry of Environment Forests has failed to recommend ban on asbestos. The study was undertaken by the Industrial Toxicology Research Centre, Lucknow for the CPCB. The political patronage enjoyed by the industry is an open secret. It is clear from the document that the ban on indigenous chrysotile asbestos mining has been lifted. In the foreword to the report dated May 27, 2008, J. M. Mauskar, the ex-officio Chairman of the CPCB and Joint Secretary, MoEF writes, "Asbestos is mainly used for manufacturing asbestos-cement sheets, asbestos-cement pipes, brake lining, clutch lining, asbestos yarn & ropes, gaskets & seals etc. Organised asbestos industrial units are mostly using imported chrysotile variety of asbestos. The indigenous asbestos is mostly used by the unorganized sector. This report provides detailed information on human risk of asbestos exposure and its health effects. The study includes asbestos monitoring at work environment, characterization and toxicity of indigenous asbestos, occupational and personal histories of workers, their clinical examinations, lung function tests and chest radiological examinations. It appears from the present investigation that unorganized units have poor industrial hygiene conditions. The report also recommends various preventive measures to reduce the risk of workers exposed to asbestos." 1. All the workers should be provided with medical surveillance by the employer. measures are required to be taken by the asbestos milling units of Rajasthan. proper engineering controls to reduce asbestos fibre emission. • Manual handling of asbestos should be reduced to minimum. • Fugitive emissions generated needs to be controlled. • All material transfer point should be connected to dust extraction system. 3. Floor should be cleaned by vaccum cleaner only. submitted to State Pollution Control Board and Central Pollution Control Board. practices to reduce the asbestos exposure. fibre/cc under the Factories Act, 1948 to reduce the risk of asbestos exposure. exposure, potential health effects, etc. CPCB officials P.K. Gupta, Environmental Engineer and J.S. Kamyotra, Additional Director for coordinated the Study under the guidance of Dr. B. Sengupta, Member Secretary, CPCB. The CPCB document refers to Project Advisory Committee members whose suggestions were deemed valuable but nowhere in the document does one find the names of these members. One would not be surprised if these members who facilitated the lifting of ban on mining of chrysotile asbestos and influenced the study to recommend continued use and manufacture were representatives from the chrysotile asbestos. Documents unearthed under the Right to Information Act reveal how industry added Rs. 16 lakh to the government's Rs. 44 lakh to commission a study by the National Institute of Occupational Health (NIOH) to "specifically indicate how technology has made working conditions [in asbestos factories] better." The study is titled "Implementation of Rotterdam Convention on Prior Informed Consent Procedures — Study of Health Hazards/Environment Hazards Resulting from the Use of Chrysotile Variety of Asbestos in the Country." Chrysotile is popularly known as white asbestos. Acknowledging the hazards from asbestos, Anbumani Ramadoss, Union Health Minister, informed Parliament: "…regarding asbestos, a lot of poor people use it. As regards the issue pertaining to banning of asbestos, as a health issue, the government certainly has not taken it up. It is an occupational hazard and people working in the asbestos factories are prone to lung cancer, but we are taking the enormity of the usage of asbestos. Mostly, poor people in the villages use it. Hence, I cannot take a decision on this issue." The enormity of usage is no excuse to expose Indian workers and citizens to this deadly fibre. Without amendment to the existing import policy by the Union Ministry of Commerce and Industry for white asbestos, its consumption pattern is unlikely to change. The study that has now been exposed through the Right to Information is supposed to be presented at the next meeting of the Chemical Review Committee of the Rotterdam Convention to rationalise its third veto against the U.N. action on white asbestos. It will also form the basis for India's domestic policy on the continued use of asbestos. The next conference of the Parties to the Rotterdam Convention will be held from October 27 to 31, 2008 in Rome. Chrysotile asbestos will be on the agenda of Fourth Conference of Parties (COP-4) as was agreed at COP-3. This treaty, a result the efforts of the United Nations, came into force in February 2004. The text of the Convention was adopted in Rotterdam, the Netherlands. The Indian government, irrespective of the ruling party, has consistently colluded with asbestos interests. The COP-3 of Rotterdam Convention held in Geneva, Switzerland, in October 2006 failed to bring the Prior Informed Consent (PIC) Treaty to apply to chrysotile (white asbestos), a known human carcinogen that represents 94 per cent of world's asbestos. Although 95 per cent of the countries sought its inclusion, the COP-3 failed to list this and the decision to include it has been proposed in COP-4 in 2008. The Indian delegation has consistently argued that the science behind the recommendation to list chrysotile asbestos was not categorical. The minutes of the Review Committee obtained recently through the Right to Information Act, dated December 19, 2006, read: "The report will be finalised after due discussions with the asbestos industry." Another meeting minutes, dated April 18, 2007, report that "...the results of the study which was under way could not be shared [with public] till the same was finalised." Clearly, a scientific study that is finalised after discussions with the corporate interests is grossly conflict of interest ridden and deserves to be scrapped. As per data released by the U.N. Statistics Division, India imported about 306,000 tonnes of asbestos in 2006. Of which, 152,820 tonnes was imported from Russia and 63,980 tonnes from Canada. The rising consumption is a result of a made-to-order science that gets exposed by the documents that show how the Union Ministry of Chemicals, acting in collusion with the asbestos industry, is manufacturing science to back its pre-determined position to fight global regulation on the killer fibre by reiterating that 'controlled and safe use' of white asbestos is acceptable both to the white asbestos industry and the Indian government. Dr. Barry Castleman, an expert on asbestos who was in India in December 2007, commented: "Anyone who says there's a controlled use of asbestos in the Third World is either a liar or a fool."